Includes : guide service, car/taxi transport to the national park, good outdoor meal by the fire in a forest camp, and beautiful arctic landscape all the time. -Autumn night under the northern lights. Includes : guide service, car/taxi transport to go to the best local spot, warm drinks and cookies around the fire, and a surprise to celebrate appropriately the most beautiful sky display of the arctic world. I pick you from the location of your choice in Luosto at 9.30, and we will drive to the national park (10-15 min drive) where we will start our hike. 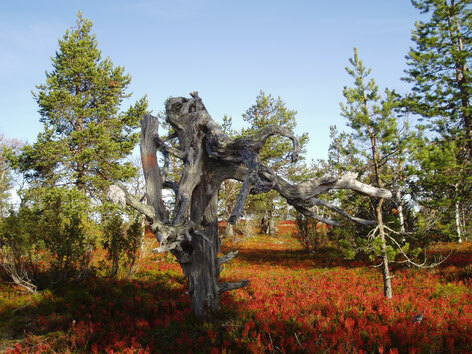 We will discover the old boreal forest, go through arctic peatlands and swamp areas, and drink the pure water from clear forest streams whenever we feel thirsty. We´ll stop for a meal around the fire in a forest camp. The menu will be grilled meat (reindeer, elk, or beef entrecôte) , potatoes in folio with parsley butter, with a glass of crowberry wine. For dessert, we have fruit, traditional pastry and coffee. On the way back, we will have the possibility to climb over the tree-line in order to have a look at the incredible lappish panorama from above. INCLUDES : Guide service, car transport, lunch around the fire, snacks on the way. Northern lights are one of the most beautiful (and most famous) sky display of the Arctic. 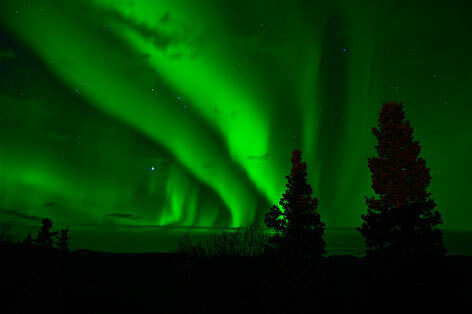 At the latitude of Luosto, you have statistically from 150 to 200 nights with northern lights every year! Of course, you can see those lights only by clear sky ! You can contact me up to 18.00 of the same day to book a northern light evening with arctic horizons. Just check the weather forecast of the evening, and phone to me ( Pascal : 00358 40 536 3085). If you want to book before hand, contact me, give me your dates of stay, and I reserve the first clear sky evening for you. I pick you by car from the location of your choice in Luosto ( from 19.30 to 21.00 depending on the sunset time) and we head for a nice open shelter, where we can wait for the northern lights around the fire. This spot is perfectly orienteed to see the northern light, without light pollution, and by the water (to catch the reflexion on the lights on the surface!). We will have some warm drinks and cookies to keep the cold at bay, and there will of course be a small bubbly surprise for you if the Northern Lihts show up! INCLUDES : car transportation, guide service, hot drinks and snack around the fire, small surprise to close the evening. More information about northern lights ? click here.